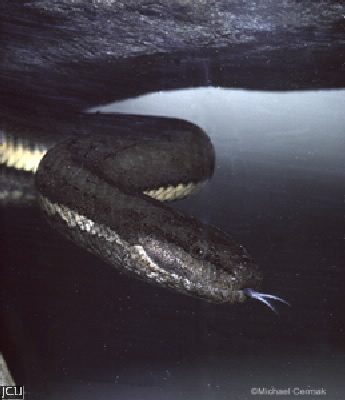 This rear-fanged snake is found associated with waterholes and streams and the surrounding grassy banks as in Half Moon creek on the Smithfield campus. It preys on a variety of small animals. The body varies in colour but most commonly is brown often with a darker stripe on the flank. The belly and lower flanks are cream to yellow with dark speckles. A dark stripe is common on the underside of the tail.